Connecting with people about stuff that is great and the great things these people do! We found 7 episodes of I Think This Is Great! with Clay N. Ferno with the tag “claynferno”. In Association with LeaguePodcast. Special Episode! do617.com/empire for a chance to win a VIP Meet & Greet. Take a trip to the Boston of yesteryear, guided by advertisements for the businesses and characters that made the city tick in the 1960s, ‘70s and ‘80s – restaurants, hair salons, bands, bars, clothing boutiques and more. Author Brian Coleman (Check The Technique vols 1 & 2) goes digging deep into Boston's post-modern advertising archives to present a core sample of cultural history. 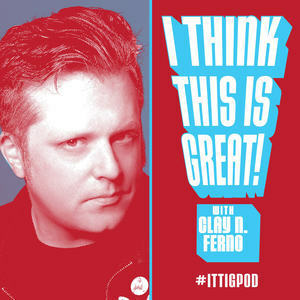 Bonus Podcast Feed for for Patreon Subscribers and Free on ithinkthisisgreat.com for a limited time! Season 1, Episode #1 (S1 E01) of this productivity podcast is an interview with LJ Malberg, the Compassionate Muse. This executive coach shares her inspiring journey about redefining compassion in the workplace. Clay and LJ talk about listening, offering feedback and asking permission to give feedback. The goal of "I Think This is Great! with Clay N. Ferno" is to motivate and inspire and LJ's story is one that needs to be heard. I Think This Is Great! with Clay N. Ferno is an interview podcast about people doing and being their best.